Long before the U.S. government began conducting secret radiation and germ-warfare experiments, and long before the Tuskegee syphilis experiments, medical professionals had introduced—and hotly debated the ethics of—the use of human subjects in medical experiments. 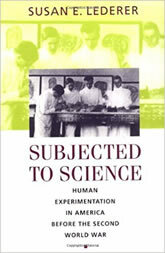 In Subjected to Science, Susan Lederer provides the first full-length history of biomedical research with human subjects in the earlier period, from 1890 to 1940. Lederer offers detailed accounts of experiments—benign and otherwise—conducted on both healthy and unhealthy men, women, and children, including the yellow fever experiments (which ultimately became the subject of a Broadway play and Hollywood film), Udo Wile’s “dental drill” experiments on insane patients, and Hideyo Noguchi’s syphilis experiments, which involved injecting a number of healthy children and adults with the syphilis germ, luetin.